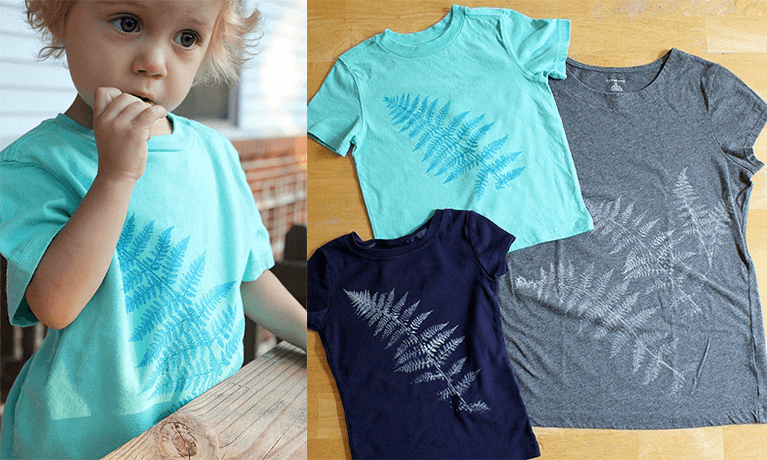 Leaf Printing on Fabric – How To Make Wearable Art And More! Leaf Printing on Fabric– How To Make Wearable Art! Isn’t it wonderful that “earth” has the word “art” in the middle? Nature is certainly one of our go-to sources for creative projects, and it’s a bonus when the results are something we can wear. We love the clothes we created with leaf printing on fabric, plus it inspired more artful projects ideas. I’ve been intrigued by leaf printing on fabric ever since I read Lotta Jansdotter’s printing book a few years ago. It’s an easy project that brings nature and art together in such a lovely way — and it’s hard to take your eyes off of the beautiful results. Luckily, you get to wear them. For our first project, Maia and I worked with a heavy cotton fabric about a half-yard long. The initial idea was to involve Maia in making some of her own clothes, and I told her I’d sew her a dress or skirt from the fabric that we decorated. On another day, we tried leaf printing on t-shirts. There are so many options, but each leaf print project involves the same process. Here’s how we made the leaf prints, and then the skirt and shirts. Step 1: We put fabric paint on an acrylic box frame (but you could also use a plate) and rolled our mini paint roller (ours was from a hardware store) on it a few times. When it was soaked with the fabric paint, we then rolled it over a leaf. You can do this on top of newsprint or scrap paper to protect your work surface. Step 2: We then placed the leaf paint-side down on our fabric, laid a sheet of newsprint over the leaf, and then rolled over the leaf a few times with the hard rubber brayer. Step 3: The best part, of course, was lifting up the leaf to see the print. Carefully lift the paper, then the leaf. Some turned out better than others, but for the most part they were all beautiful. 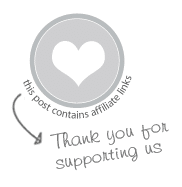 WEARABLE ART: SKIRT, SHIRTS, AND POSSIBILITIES! I used our first large piece of leaf print fabric to sew a skirt for Maia, with a gathered waist and a brown ribbon along the bottom edge. And I used some of the remaining fabric to make a matching leaf print applique to cover a stain on one of Maia’s t-shirts. Next, the mamas of our toddler’s art group got together to try the technique. We love our toddler art group for weekly get-togethers of kiddo finger-painting, etc. But we’ve also found it’s necessary to meet for mamas’ art nights, including a little wine, chocolate, and chat time. So we gathered at my friend Meg’s studio to experiment with printing on various fabrics with leaves and ferns. I made fern printed t-shirts for myself, Maia, and Daphne. I also made leaf prints on muslin to turn into napkins by sewing them onto a fabric backing. At that time, any free sewing time had been hijacked by Maia’s birthday (making rainbow bunting and dress-up play fabrics), so that had to wait a little longer. But it was inspiring to know the fabric was ready to go. I really love the detail in these leaf prints and especially like the ones that have more than one color of fabric paint. Leaves are just so beautiful, and leaf printing on fabric is now one of my all-time favorite artful activities. There are so many options for what you can create — a table runner, a doll blanket, a pillow, even curtains. And leaf printing on paper opens up another realm of possibilities! How about you? Have you tried leaf printing on fabric, or paper? I would love to hear about how it worked for you and what you created! I love Lotta’s book and have been waiting for ages to try one of her projects too! Yours turned out beautifully! LOVELY! I especially love the intense look of total immersion in Maia’s face. That turned out really well! Nice job! This is such a great idea. I love that she “made” her own fabric for her own clothes. So cool! I like the fabric result! It reminds me of my FAVORITE craft project that my mom did with my brothers and me. We would go outside in the fall, pick up colored leaves, place them between two simple sheets of wax paper. Then, she would lightly iron over them with us watching. When cool, we would tape our own leaves (sandwiched in the paper which now was stuck together) in the big kitchen window. The light coming through was beautiful! It looked like we had just made totally natural, quick, stained glass windows! *note, as an adult it might not look awesome, but I can tell you that I remember being a thrilled 3-5 year old! That would make a beautiful table cloth too. I can’t wait to see the skirt! This fabric turned out beautifully. I love the colors you chose. Stunning fabric, great colour choice. Ooh, these prints turned out beautifully! Love the soft delicate detail and depth! Congratulations! Fabulous project. By the way, where do you get your plain newsprint paper? I have put the book on my wishlist and will plan to do this project with my children this summer. yeah! Summer is almost here! LOVE IT! Totally want to borrow your idea…I’m thinking about making reusable grocery bags with the fabric as end of the year gifts for our preschool teachers:) Thanks for never failing to inspire! I have some that my mom left with me from her visit last summer (she was doing grave rubbings, of all things, as part of her genealogy research). But they sell it at the art supply stores, of course. The printed fabrics turned out so great! I love the colors together too. What fun! Love all the colors and details of the leaves and ferns! Question: how did the paint and fabric hold up to multiple washes? Did you wash the clothing different than regular clothes? Thanks for sharing. I know my daughter would love to do this!